I am steady working on all kinds of crochet food patterns thanks to my 5 year old! 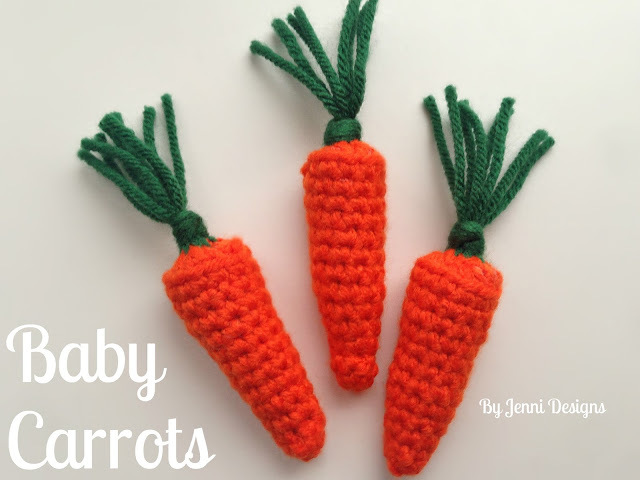 Today I am sharing the baby carrots he requested and within the next few days I will have up the large carrot pattern too. Any worsted weight yarn will be suitable for use with this pattern, for my carrots shown I used Caron United Yarn. Be sure to work your stitches tightly and stuff your carrots firmly but not so much that you create holes in the crochet work. Row 2: Sc in the very first sc you made, you will now be working in the round. Sc in each around. Row 6-9: Sc in each around. (10 sc) If you haven’t already, sew in your beginning end and turn the piece right side out. You can now stuff your carrot. Row 14: In BLO: Sl st into first sp, [Ch 1, sc] in the same sp. *Sc2tog. * Repeat *to* 3 times, sc in next, *sc2tog. * Repeat *to* 3 times. Join with a sl st.
Fasten off, sew hole shut and sew in the end. Cut 4 strands of yarn, with each strand being about 8” in length. Using your needle, pull each strand through the top center of the baby carrot. When all 4 strands are threaded through, knot them together tightly. Trim to 2-3” in length to finish off.